So you've downloaded a couple Mirage aircraft and they look pretty good. But they look a little out of place sitting at a civilian airport. 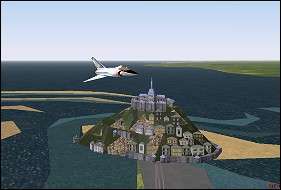 I have collected airbase sceneries for nations that operate the Mirage (see the menu below). It is also very common for NATO and other nations to cross train and/or participate in each other's air shows. This means flying to one or the other's base of operations. 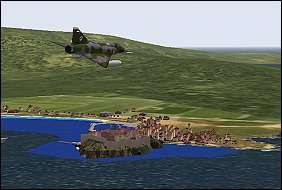 To make the flights between airbases more interesting, particularly across France, I have collected several scenery add-ons for France. Notes: Covers all of France and the Island of Corsica. Designed for FS2000. Notes: Covers islands of Sardina and Corsica. Designed for FS2002. Notes: Cities and towns for the island of Corsica. Designed for FS2004. Recommended for use with Corsica mesh scenery by Jean Gabriel Laurent. Requires FSNova texture files. 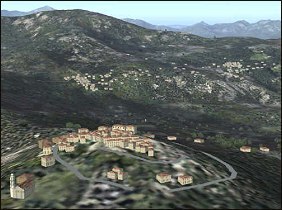 Notes: VFR scenery (cities, towns, and other landmarks) for the island of Corsica. Designed for FS2004. See Readme. Recommended for use with Corsica Sardaigne mesh scenery (17.5MB) by Pignot Thierry. Notes: Scenery for city and Citadel at Bonifacio on the southernmost tip of the Island of Corsica. A short flight from Figari (LFKF). Designed for FS2000. Notes: Scenery for city and Citadel at Calvi Ste-Catherine on the Island of Corsica. Designed for FS2000. 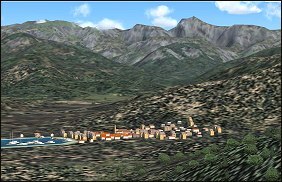 Notes: Scenery for city of Ajaccio located on Island of Corsica, 6 NM West from Campo Dell 'Oro airport (LFKJ). Designed for FS2000. Also download AJAC_FIX.ZIP (45KB). Notes: Designed for FS98. Covers just about every airport and airbase in France. Check out Alain's website for a list of all that's included. 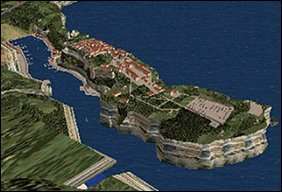 Notes: FS2000, 2002, 2004 sceneries for Monte Carlo, Nice, Cannes, Toulon, St. Tropez, Marseille, Nevers, Lyon, and Mont St. Michel, etc. 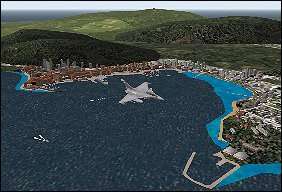 Notes: Detailed FS2000/FS2002 scenery for airports and cities on Island of Corsica. Designed around Thierry Pignot's Corsica/Sardina Terrain Mesh Scenery (above). Notes: Adds detail to several civilian airports in southern France area. Something to buzz over or fly to for a weekend rendezvous.